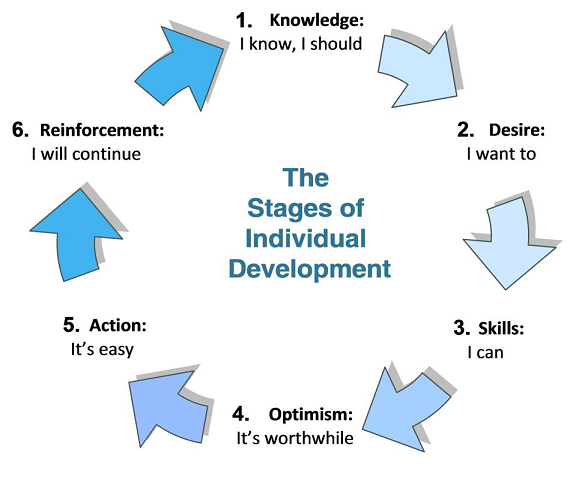 This tool provides a snapshot of the individual development process. It shows the six evolutionary steps in how individuals feel about change. By figuring out where you are in this cycle, you can envision what you need to do next in order to make progress. Say you’re thinking about improving your marketing skills, but feel conflicted about the time and focus it might require. You’re between Stages 1 and 2, and your challenge is figuring out what you want to do. Before worrying about how exactly to develop yourself in this area, focus your energy on figuring out if the results are worth it. Will you be better at your job? Will you be happier? Is this something you really desire? If the answer is yes, then you’re ready to move on to Stage 3. Begin thinking critically about the plausibility of the task. Do you have the time to learn this skill now? Do you have the resources to follow through? If so, move on to Stage 4 and ask yourself whether the goal is truly worthwhile. Perhaps make a list of the positive outcomes that will result from taking action. Then, take action! Most people get stuck between Stages 4 and 5. Remind yourself that you possess the desire, skills, and optimism to follow through and then the action steps can be simple. Moving on to Stage 6 is just as important as taking action: reinforce the development continuously to avoid slipping backwards through the cycle. Re-evaluate yourself before and after the change. In our example, this could mean asking yourself whether or not you’ve been able to draw in more business through your marketing efforts, or if you’ve been able to market more efficiently. Think about the action steps that were most effective and focus on those throughout your continued development.